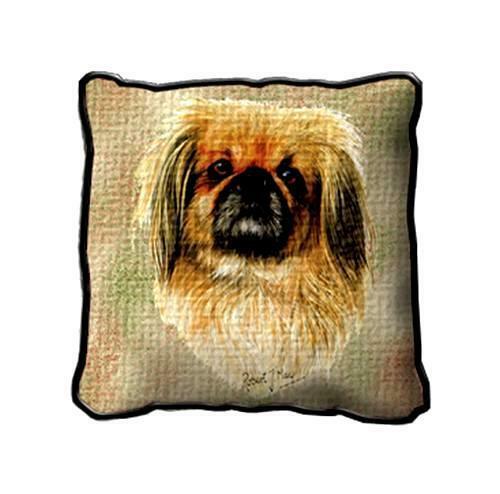 "Pekingese Pillow" This creative canine image was created by Robert May, one of the world's leading canine artists. The image of the dog's head is depicted on a beige background in a lively pose. Robert prides himself on creating lifelike paintings of his subjects. Measures 17" Long x 17" Wide. **If there is a particular dog you are looking for just email me and I will let you know if I have it. PLEASE NOTE: Shipping ONLY within the continental U.S. Hawaii, Alaska, and Puerto Rico must contact seller for shipping quote before ordering.